Now you are on my page about about early Rag-Racing for Whippets in England with some amusing old photos! 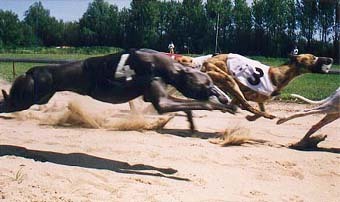 The picture above shows Greyhounds literally flying along. (Note shadow of the grey dog with jacket #4, how high off the ground it is!) Taken by my son Adrian at our local Danish racetrack. Here you see the careful weighing in prior to a Rag-race. This was because they started heavier dogs in front of lighter dogs, to handicap the faster light weight dogs. 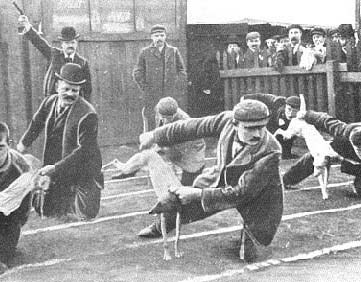 At the end of the 19th century, Whippet racing was taken very seriously in those parts of the country (England) where it was widely followed, chiefly the Midlands and North. 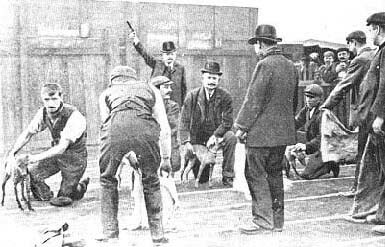 A day with the dogs was quite a social occasion, with bookmakers, large cash prizes, and more spectators than we are used to today. A good dog was the pride of the family and often quite a source of income as well. Although the children might go to bed on bread and cabbage, the Whippet was sure of his piece of meat. A dog which could possibly win more in an afternoon than it's owner's weekly wage packet was well worth cherishing, so it was no wonder that, in an age of general callousness to animals, the racing Whippet was usually well cared for. Up to this time the rules varied from club to club. Some required pedigrees, or that the dogs be of "Whippet type", but at others Whippets and terriers competed together, graded only by weight or performance. In the North, miners probably made up the majority of those involved and the Sunday morning activity acted as a tonic on members whose working week was spent chiefly underground. The job of walking the Whippets frequently fell on the wives and children, contributing much to the fact that modern Whippet racing, whether pedigree or not, has become a great family sport, the whole family often taking off together every weekend through the summer, to compete at their own home-club or elsewhere. The picture to the left shows the very uncomfortable attitudes of both dogs and handlers, just before the starter's gun is fired! 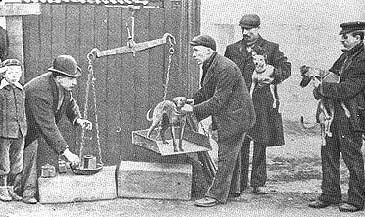 Good handlers were very important and some of them were cleverer at it than others and so became extremely popular. It was an art to be able to throw the dog forward a long way and at the same time in such a way as to give it a good start so it landed in full stride without falling or tripping. CLICK HER FOR NEXT PAGE all about how to get your dogs together after you have been out all day with just one or two of them. GO BACK to CHOOSER - but I hope you'll go onwards! Maybe I can be of help if you have any doggie problems? I have studied dogs all my life and read all I can get hold of that has been written about them, so MAYBE I could come up with a good idea and useful advice!? Try me!